Pets can track a lot of dirt and mud into a vehicle and they can create messes that are hard to clean up. A pet-friendly vehicle is outfitted with all-season floor mats. These are easy to clean so you can pick up after your pet and know that your vehicle will not be permanently damaged by all that he drags into that vehicle. 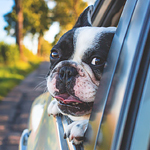 A pet-friendly vehicle will have options for backseat climate control. Your pet might like to have things set up at a different temperature than you do and you pet may get hot or cold if they do not have a fan blowing on them. This is an important feature if you want to keep your pet happy.